One of my favorite scenes from one of my favorite movies... and my kids are finally old enough to appreciate it. This is totally NSFW, but it's totally f***ing funny! I can't resist meerkats, but they're even cuter when they're sleepy. Forget about the the fact that you're choosing to watch a commercial, and just enjoy the cuteness. No comment, other than "seen here." 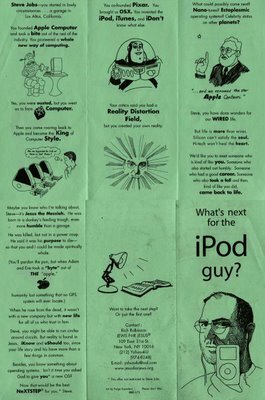 This flyer from Jews for Jesus* uses Steve Jobs to sell their message; click it to see it big, so you can read this ridiculous thing. *Jews for Jesus, for those of you that aren't familiar, is a group of people who believe in Jesus that call themselves Jews. Ridiculous, because believing in Jesus' divinity makes you -- by definition -- Christian. Jews can't believe in Jesus. BoingBoing pointed us to the Flickr site of Narcofiche for this one.